I can’t take credit for this delicious and beautiful (did I mention refreshing?) salad. I WILL take credit for relaying it to you, though. I tore it from Eating Well Magazine possibly before the internet was a thing…maybe not that long ago, but it’s been a favorite for a long time. It’s one of those things that you just keep coming back to, and you never forget it. 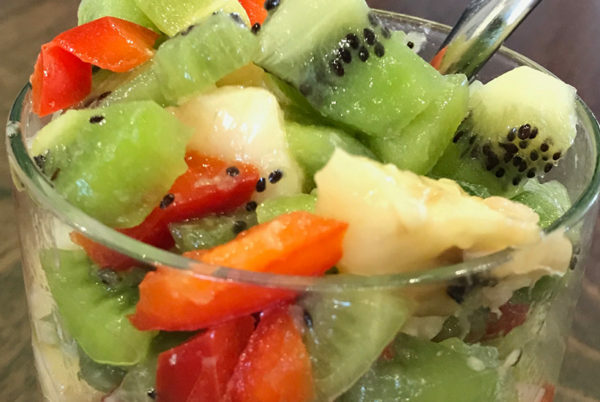 The basic fruit flavors that the name suggests are good, but what makes this salad unique and super–delicious is the addition of unexpected touches like red bell peppers, cayenne, and mint. My favorite way to serve this is in chilled martini glasses, but the last time I made it, they weren’t available so I used the cute little tumbler you see here. Next time I’ve got a martini glass and this salad in the same room, I’ll shoot a pic to y’all. However you choose to serve it, I guarantee you’ll love it. Heck, just eat it with a spoon right out of the bowl. A tip for big crowds: you can prep it all except the bananas the day before putting everything together. If you double or triple the recipe, don’t use all the dressing (it’ll be too soupy). Save it for a different fruity dish and fall in love again.